Unless you're in a tournament, deciding the order of play (who goes first?) on the first hole is usually done with something casual like a coin toss or throwing up a tee to see who it points to when it comes to rest. After the first hole has been completed the right to hit first, called the "honor," belongs to the player with the lowest score on the previous hole. If the last hole was tied go back to the score on the hole before that, and so on. You "tee off" from within the teeing ground. You may place your ball on a tee to raise it up off the ground a bit if you would like. This is not required, but most players do it and it's a good idea for beginners (more room for error). 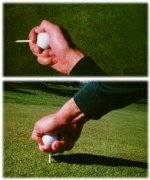 Probably the easiest way to tee your ball is to place the ball and tee in your hand together so that the tee is supported between your first and second fingers (see picture below). Then, pressing down on the ball with the tee directly beneath it will easily drive the tee into the ground (if the ground is so hard that even this method won't penetrate the soil I hope you didn't have to pay a green fee). The height which you tee the ball is up to you (General rule: the longer the club the higher you tee it -- somewhere between one-quarter of an inch and one inch will usually do it). Of course the object of the game is to advance your ball into the hole with the fewest possible strokes, so your goal is to play the ball toward the hole avoiding obstacles and hazards along your way. The fairway is a nice target for your first shot on many holes, though on par 3 holes probably the green, or putting surface, is your primary target. Advance your ball toward the hole, the player farthest from the hole going first on each shot, until the ball is in the hole. Once everybody is on the green remove the flagstick, as long as everybody is close enough to see the hole, and putt out. If someone is far enough away that they can't see the hole another player may attend the flag. When everybody has finished, replace the flagstick into the cup and proceed to the next hole. Golf courses are usually laid out in a reasonably organized manner where the putting green of the first hole is somehow adjacent to or near the tee of the second hole and so on. Note: When you initially approach the green it is wise and courteous to put your clubs and paraphernalia on the side of the green nearest the next tee. This saves time and keeps the following group from having to wait unnecessarily while you walk back and forth to retrieve your clubs. Always wait until the way is clear before hitting a shot. If your ball is headed toward someone (this is one time when it is NOT appropriate to be quiet) yell, "FORE!" This alerts them to the potential of an incoming projectile. Always wear a hard hat on the course ... I'm kidding! If there is a gap between your group and the group in front of you (as a result of a difference in pace of play) and the group following you is waiting for you on every shot, allow them to "play through." This is a courtesy that will be extended to you in kind at some point in the future. Most foursomes should be able to complete an 18-hole round of golf comfortably in four hours if they're walking -- probably faster if they're riding in golf carts. To be reasonable, if you're going to be on a golf course with other players who are also trying to enjoy their round, then holding up play is rude. If it gets bad enough, pick up your ball and move on to the next hole if you are falling behind. As your skill level improves this will happen less frequently, unless you are an unusually slow player.